Samsung Ends Negotiations, Stranding Occupational Disease Victims and Their Advocates | Stop Samsung - No More Deaths! 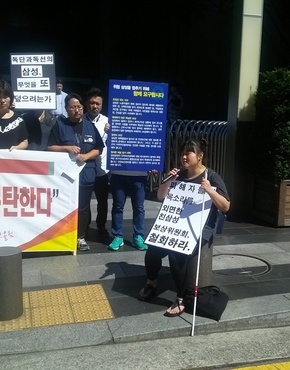 Kim Mi-seon, a former Samsung LCD worker suffering with multiple sclerosis, was among the 55 Samsung workers and their families who attended the press conference on Sept. 7. Samsung Electronics Co., Ltd. has effectively walked away from negotiations with SHARPS and other families of the victims of its blood disorder cluster by forming an ad hoc vehicle focused solely on compensation. The latest move by the world’s largest technology company appears to be an attempt at paying the victims off on its own terms, and at frustrating the three goals of SHARPS–to have Samsung apologize to victims, to compensate them and to have publicly verifiable prophylactic measures in place. On Sept. 3, Samsung said it has launched a Compensation Committee in what it said is to promptly compensate blood-disorder stricken employees and their families. In appearance, the news seems to be an extension of an earlier announcement of Aug. 3, in which it said it would create a KRW100 billion (U$85.8 million) fund for current and future victims. However, the two announcements marked yet another nadir of Samsung’s credibility. Indeed, over the two years of negotiations, the company has deflected the advocates’ and victims’ demands piecemeal, steadily draining already strained financial and political resources of SHARPS and allies. Premeditated or not, Samsung’s maneuvering was possible in part because after eight years of lone and hard-fought campaigning against the country’s mightiest corporate giant, SHARPS was fractured by a split. In August 2014, about a year into its first negotiations with Samsung, six of the eight families of the cluster victims SHARPS represented broke out and formed a separate negotiating bloc, the Family Settlement Committee—a sign that some families would like to prioritize compensation over demand for an apology and independently confirmed preventive measures. In Sept. 2014, Samsung and the Family Settlement Committee agreed to a Mediation Committee, an independent arbitration body to investigate all parties’ concerns to make recommendations for settlement. In December 2014, at the urging of Samsung and the new negotiating bloc, SHARPS endorsed the Mediation Committee and cooperated with its activity. Samsung should donate KRW 100 billion (U$85.8 million) to forming an independent entity to compensate the victims and to work as an “ombudsman” for Samsung’s workplace safety practices. The entity should categorize 12 occupational diseases into three types to compensate the victims depending on the level of causality between the victim’s working conditions and contraction of the disease. As it attempted to walk the fine line between the advocates’ and the corporation’s needs, the committee made mixed recommendations. It urged Samsung to compensate all victims, employed full-time or not. However, the committee fell short of requesting a publicly verifiable worker safety measures, instead recommending an independent grievance procedure. While South Korean media touted the recommended three categories as comprehensive, the suggested payout for the categories will be likely much lower than even the country’s hard-to-get and parsimonious workers compensation. The suggested payout scale hit some victim families hard because they exhausted legal recourse. Both SHARPS and the Family Settlement Committee sought for revisions in the recommendations to finalize a deal. And on Aug. 3, Samsung abruptly said it would launch the KRW 100 billion fund and reject the recommendation for an ombudsman. With the Compensation Committee, Samsung effectively ended the mediation structure and the negotiations. What is so stark by their absence in Samsung’s Compensation Committee are the criteria for compensation. The company has yet to say if it will use the three categories suggested by the Mediation Committee or comes up with its own. It said little about how much it would compensate the victims. However, according to a Sept 9 expose report by the independent daily Hankyoreh <Korean>, Samsung unsuccessfully attempted to retain the Korean Society of Occupational and Environment Medicine to re-evaluate the three categories. The bait and switch continues. According to a report by Ohmynews.com, an independent online news site <Korean>, Samsung has brought Park Sang-hoon, a lawyer for the Family Settlement Committee onto its committee without the consent of the families. On Sept. 7, SHARPS and 55 victim families held a press conference at the Samsung headquarters. The following is a full English translation of the statement announced at the conference. The translation is almost entirely verbatim and all brackets ([ ]) are added by the translator. With that announcement, Samsung has shredded its own promise to resolve the issue of the occupational disease cluster through a dialogue with society. It revealed that the company has neither will nor competence to address it. It has scorned and deceived the occupational disease victims [of its own factories] and indeed society itself. It was Samsung that proposed the current negotiations with SHARPS in Jan. 2013. It was also Samsung that proposed and almost pushed through a mediation process in Oct. 2014 when the Family Settlement Committee embraced the proposal. However, Samsung is now railroading through its own compensation framework, running counter to recommendations by the Mediation Committee. The Compensation Committee” is the framework that Samsung has been insisting upon since a public apology by Samsung Vice Chairman and CEO Kwon Oh-hyun [in May 2014 to occupational disease victims and their families]. Samsung’ Compensation Committee may only appear to be an external organization in appearance, but in essence, it is an instrument to recast the issue of compensation in Samsung’s terms. Since early stages of the negotiations, SHARPS has raised concerns that such opaque organization cannot be used to address the issue of [Samsung’s] occupational disease. In its proposal, fine-tuned by Samsung’s own negotiators and the victims’ families and reviewed by experts, the Mediation Committee recommended a public entity be formed independently of Samsung [to preside over compensation.] Public health and law professionals at home and abroad have since asked Samsung to comply with the recommendations. However, Samsung did not follow any of these recommendations and pleas and instead unilaterally formed the Compensation Committee. In so doing, Samsung flouted the fundamental principles of social dialogue and renounced what is left of the dignity it would have retained as initiator of the negotiations. Its shamelessness and impudence is only infuriating us. Samsung said lawyer Park Sang-hoon would sit on the committee on behalf of the Family Settlement Committee. However, some members of the settlement committee immediately said Park’s presence on the committee had never been agreed to. If Samsung’s ignored these families’ opposition and appointed Park to the Compensation Committee, this would be an unacceptably despicable maneuver. Even if the settlement committee agreed to Park’s seat, he would only be able to represent the six families of the settlement committee. To date, a total of 217 occupational disease victims and patients have reported to SHARPS from Samsung’s semiconductor and LCD units. Minus the six families of the settlement committee, the number still stands at 211. And SHARPS is assisting 50 of the 217 in their workers compensation petitions and related litigation cases. How can it be said that Mr. Park can represent all these victims who are duly entitled to compensation and apology [from Samsung]? What is worse, the way Samsung has seated the four Compensation Committee members is so imperious that it is just astounding. Why and how are these four individuals authoritative experts, as Samsung claims them to be? We have no idea what they have done to confront the issues over the past eight years [since SHARPS was formed]. One member, and only one member, is familiar to us: Prof. Won Jong-uk of Yonsei University. This is because Dr. Won presented an expert opinion as a consultant for Korea Workers Compensation & Welfare Service, claiming that there was no link between a deceased Samsung worker and her working conditions. Samsung exposed the lack of a will and competence to address the issue of occupational disease. Then, even before a mediation proposal comes out, in April 2015, Samsung abruptly proposed negotiations on prophylactic measures be postponed. In August when negotiations had to be initiated over the Mediation Committee proposal, the company said the mediation process should be on hold, and the Mediation Committee adjusted the timeframe accordingly. Suddenly and one-sidedly, Samsung announced formation of the Compensation Committee, minus preventive measures in toto. Given this maneuvering, who can expect Samsung will in good faith implement the mediation process? We ask Samsung: Do you have a will to have a dialogue on an apology and preventive measures? Do you have smatterings of social responsibility, or the competence to implement corporate social responsibilities? Most of all, the biggest problem with Samsung’s announcement is that it derided occupational disease victims and deceived members of civil society who work hard to solve status quo. Is this Samsung’s ultimate purpose of the proposal for dialogue it made three years ago? In its own official blog post of Oct. 21, 2014, Samsung urged SHARPS to participate in the Mediation Committee, and to negotiate with sincerity and transparency. Is this your way of achieving sincerity and transparency? In another post, the company said, “We will do our best before the Mediation Committee to complete an amicable mediation process.” Is this Samsung’s best? Its effrontery to make an about-face to dodge corporate social responsibility, its arrogance and arbitrariness to solve the disaster of its own making, its deception of bereaved families of victims sacrificed for its pursuit of profit—are these are the vision an ambitions of the so-called Lee Jae-yong managerial regime? Is he intent on inheriting not only money and power but an anti-social, anti-human rights corporation? SHARPS, the advocate of eight years campaigning for the rightful solution to Samsung’s occupational disease issue, and families of 54 Samsung workers who fell victim to the cluster are demanding Samsung the following: an apology for the Compensation Committee and an explanation.